This week we got the Outfox Field Guard Foxtail Guard for Chico, and I couldn’t be happier! 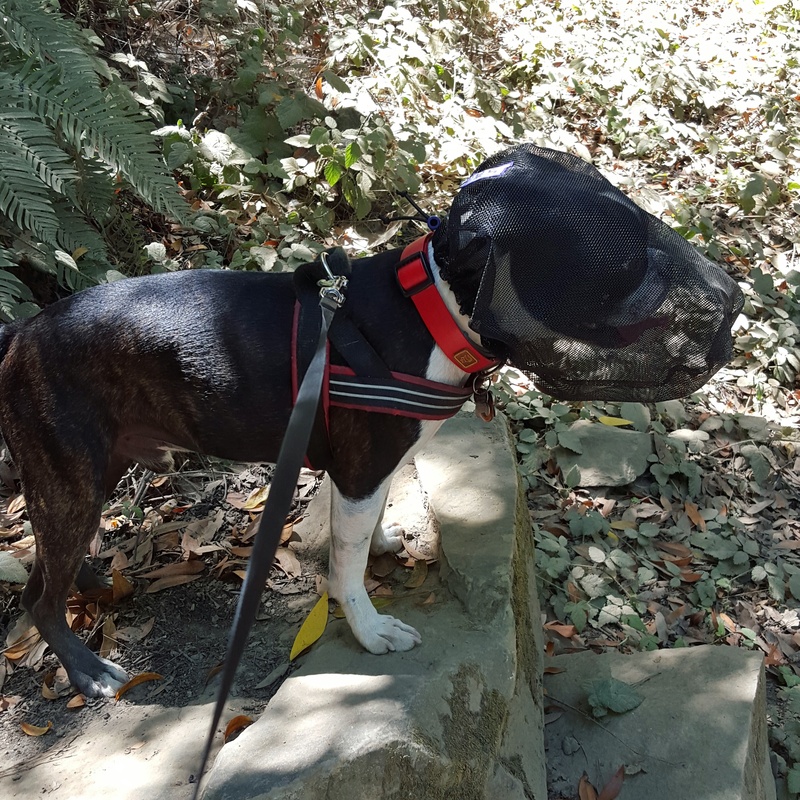 Ever since we had our Foxtail emergency, from him just bending over while on a sidewalk and sniffing one, I have been on edge when hiking, and going to certain parks. As soon as we hit the trail with this on, I felt it all wash away. We decided to look at one in person, and went to Holistic Hound​ in Berkeley, where the sales clerk was super nice. She pulled out a tape measure to insure we were getting the right size–I measured beforehand, but felt extra good that she also measured, without me even asking her to, we both got just about 8 Inches which is size small, and then she came over and popped it right on Chico, and Chico just went on with his business of sniffing everything in the store, and licking the staff through the netting. He made no objections whatsoever and didn’t need a bribe:) Afterwards they wanted to give him a treat, which was a great thing cause I got to see how easy it pulls off with human hands. I felt really confident, that their staff knew what this product was, and how it worked–and it wasn’t just something sitting and getting dusty on a shelf. 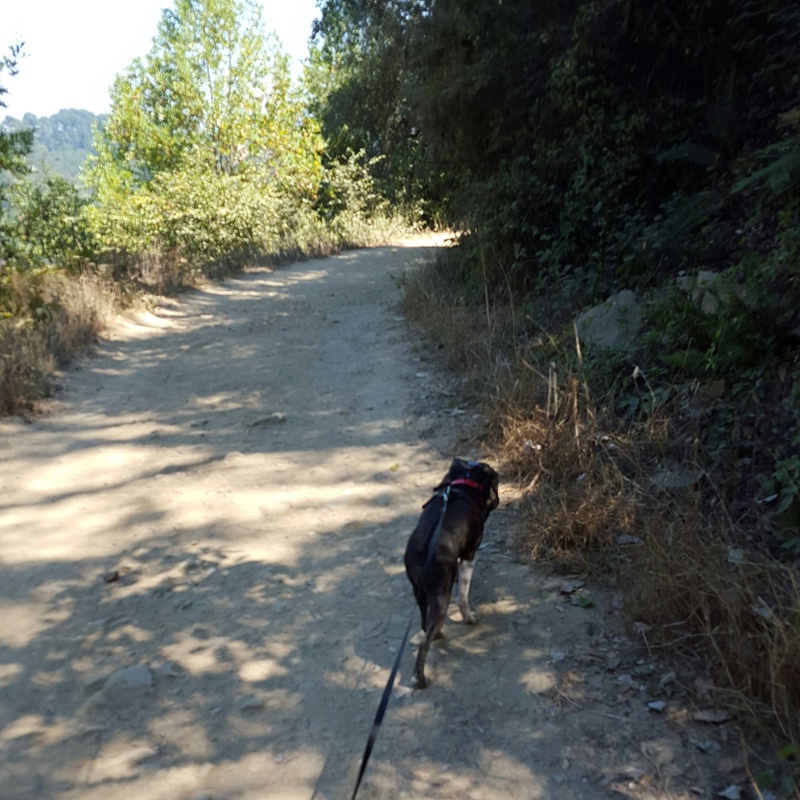 On the trail, Chico acted normal with it, he still sniffed ALL THE THINGS, he never pawed at it. I was able to easily take it off to give him water, though they can also drink water with this on, I was taking it off to check it and him out, so far we have tested it on hot days, and he is able to pant through it just fine, he doesn’t pant more or less with it. 10 mins into our hike we caught a foxtail that looked just like the one the Vet pulled out of his nose. Foxtail Caught in front area of the mask. It also has 2 velcro straps to attach to the collar, but I haven’t needed to use there. A Bonus : He can no longer eat horse or cow poop with it on. A con: Can’t take as many cute dog photos!!! So far he has met about 15 dogs with this on, and none of them seem to notice it or treat him different. We passed even more dogs who just ignored him and he ignored them. We will test it to see if he can still retrieve with it on…There is enough room for him to get his mouth on a ball…but will it wear the mask out? For me, the $45 to $50 price tag is worth it. Chico had to be put under to take the foxtail out, and that is said to be the most dangerous part of basic surgeries, especially for smushfaced dogs, and wathcing him in pain was just awful. California is just horrible with foxtails right now because of the drought. They are everywhere. Thank you for a great review! This is Diane, the designer of the OutFox Field Guard and I’m just seeing this now. I glad to hear how helpful the staff at Holistic Hound was. It is always so gratifying to hear how easy the Field Guard for dogs to get used to. When I designed it, it was very important to me that it be absolutely comfortable for the dogs. 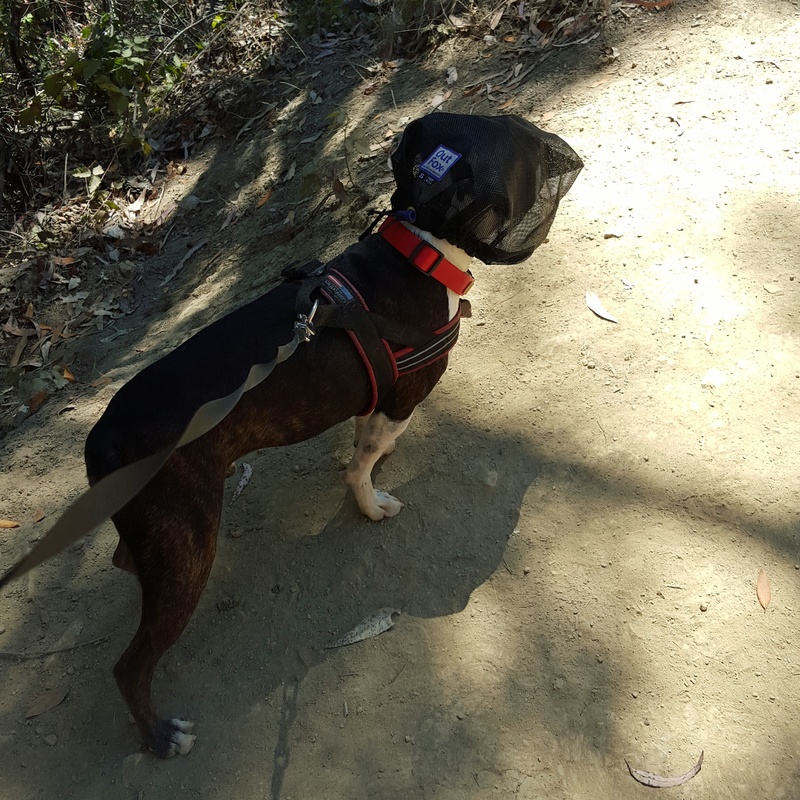 And you show that it is also very comfortable for a short snout dog hiking on hot days. Thanks again for such a complete review with lots of good photos. Thank you so much for making such a wonderful product, I never want to see my dog with a foxtail stuck in his nose again!